Have you been wondering about the quality of the products from CafePress? Have you considered buying something and then reconsidered because you feared shoddy workmanship? Fear no more. CafePress items look as good in your hand as they do on their website. I have right here at my left hand a beautiful high gloss finished large coffee mug with one of Rob Harrington's incredible photographs on the side. 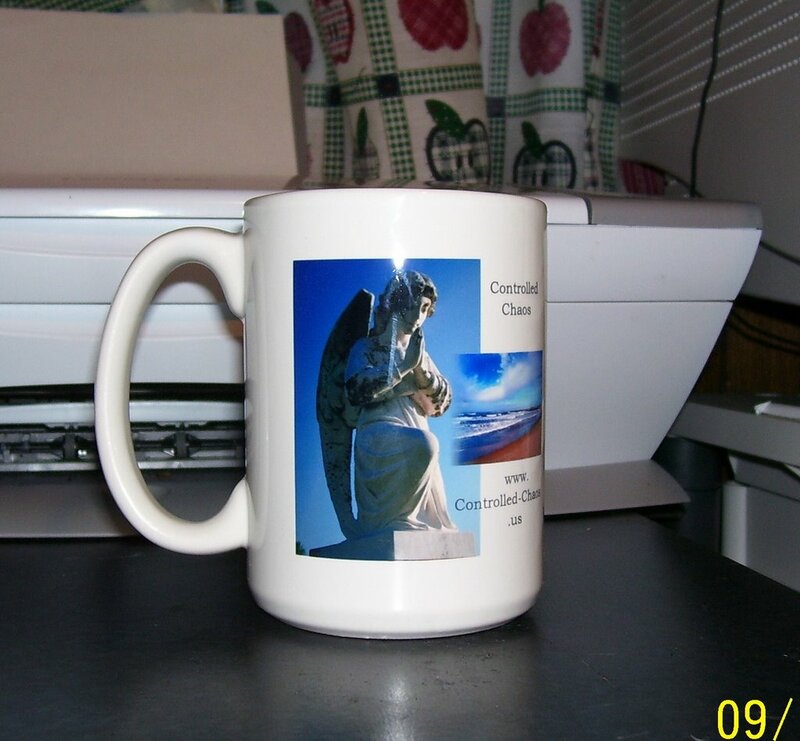 I chose Rob's logo mug with the angel-ocean collage. The photo-detailing on the cup is crisp and clear -- doing justice to Rob's originals. The weathing on the angel statue has been faithfully reproduced, and footprints can clearly be seen near the shoreline by the sea. The 15 ounce mug itself is high quality ceramic. It has some heft to it. It is not a cheap ceramic that one would sit on a shelf for show. This mug begs to be filled with your favorite hot beverage. Note: I do not work for CafePress or Rob Harrington. This is a completely unsolicted commercial. I will receive no compensation -- monetary or otherwise -- for this plug. I'm so glad that the products look so good! I haven't even seen them myself yet. Thanks for the info... And the plug! As far as giving them away... I would really like to do a promotion of some sort. I was thinking of some sort of contest or something with the logo mug as a prize. I just need to get the funds first, but I'll keep you posted! morning.i hadn't heard of eihter but the mug looks beautiful. i'm always in the look out for good ones for that particular coffee drinker in my life. it would certainly make a good christmas stocking...thanks i'll go look into it..and i love the angel in yours..
oh btw, you have the cleanest table ever. thanks for sharing this info about Cafe Press. glad to know it's quality stuff. I have to ask -- does the person who's stuff you buy (aka Rob) get any part of the proceeds, or does it all go to Cafe Press? C.K. -- yes, generously so! Morgen -- yes Rob gets a portion, but I don't know how much. Enjoy the new mug Quilly, it is very nice.